Call us for a quotation, assistance or advice. How to contact us? Just email, call or fill in the addiction treatment query form below. We are here to assist where we can, and all of our team, are always glad to assist you wherever we can. 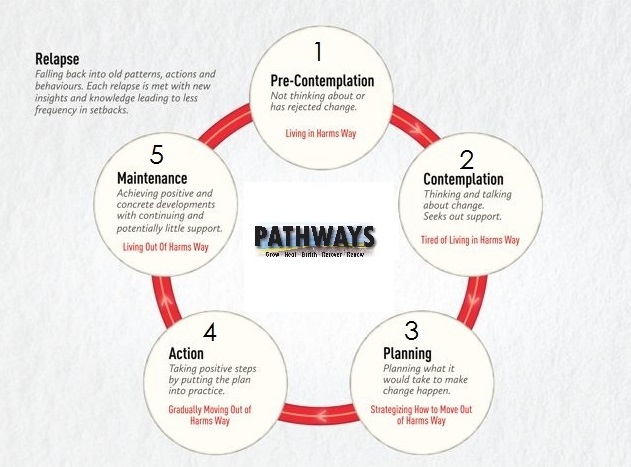 Pathways stages of change in drug addiction treatment. We offer a broad selection of evidenced based and innovative, modern clinical approaches in order to ensure that all clients receive the most progressive form of therapy designed to suit their particular needs. Programmes are personally tailored to provide the addicted person with various avenues to ease the discomfort of withdrawal, avoid relapse, and re-establish a lasting connection with themselves, with others, and with a higher power. GETTING STARTED WITH PRIMARY IN-PATIENT TREATMENT ? Primary in-patient treatment programmes include group work, lectures, therapy sessions, progress sessions and general therapeutic activities. Pathways offer the very latest methods of 12 step and psychological recovery at our addiction treatment centre. With decades of combined and up to date professional experience, we have gained significant success results, that are fast becoming a well know trend in the world of recovery. A wealth of local professional practitioners complete our client offering, ensuring world class standards of healthcare are maintained. Our modern, yet classical programme approach to getting our clients ‘better than well’ rests on an existential, warm and person-centred approach to therapy. Drug addiction treatment at a small and intimate facility such as Pathways is not as scary as you may think. In fact most people who arrive at our doors are thankful to be there within the first few hours of arriving! It is a liberating feeling knowing you are finally doing all you can to develop your life. To move forward with your dreams, plans and life purpose. Oftentimes there is nothing more freeing, or powerful, than making a firm decision to do whatever it takes to make changes in your life. In life, we need other people. We need others to understand us, help us and move us forward. No one is an island.